What may be more surprising about the new adaptation of Dr. Seuss’s beloved The Grinch, is it comes from co-director Scott Mosier. That’s right, Kevin Smith’s long-time producer has made a big budget family christmas film. Does that mean Illumination allowed him to fill it with adult humor? Oh the places they could’ve gone. 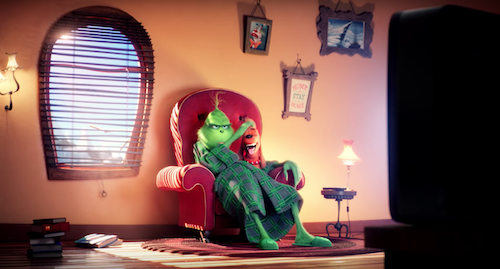 Instead, our beloved mean one, Mr. Grinch, is stuck in a movie that’s the same size as his heart: two sizes too small. The story remains exactly the same. So much so it makes me question the film’s purpose. It’s December 20 and The Grinch (voiced by Benedict Cumberbatch) has just awoken to find he’s run out of winter supplies. Now, he has to head out to Whoville to find sustenance so he can return to his house on the hill with loyal Max. Along the way he discovers Mayor McGerkle (voiced by Angela Lansbury) wants to see Christmas be three times bigger this year. Meanwhile, little Cindy-Lou Who (voiced by Cameron Seely) wants to meet the real Santa Claus and hatches a plan. A plan which may blow The Grinch’s own who is dressing up as Santa to steal all the presents from Whoville. For those looking to spend money on a brighter, shinier, version of The Grinch, this film’s for you. For the rest of us, the original 1966 classic will certainly do. At least it’s better than Ron Howard’s 2000 disaster. It’s visually appealing and Cumberbatch seems born to voice The Grinch, it’s just too bad the character is surrounded by the exact same story. A giant Christmas tree in town square is hardly enough to warrant a new remake. But Illumination knows how to keep things light enough to bring in the bucks, and on that note alone, they’re going to have good luck. If you have to go see The Grinch I suppose you could do worse, considering the alternative is The Nutcracker, maybe families are cursed.